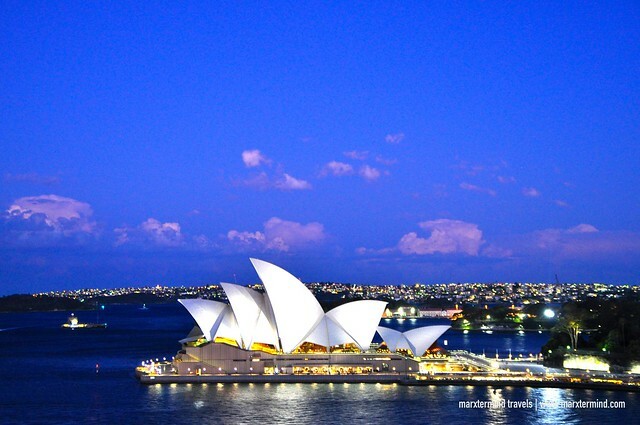 I began my great expedition in Australia by visiting its most famous city Sydney. I was solo when I went to Australia through a flight from Manila but it was great that I have friends who lives and who were also on a vacation the same time that I was there. I am fine traveling alone but well; let’s admit it… having friends around is absolutely more fun. 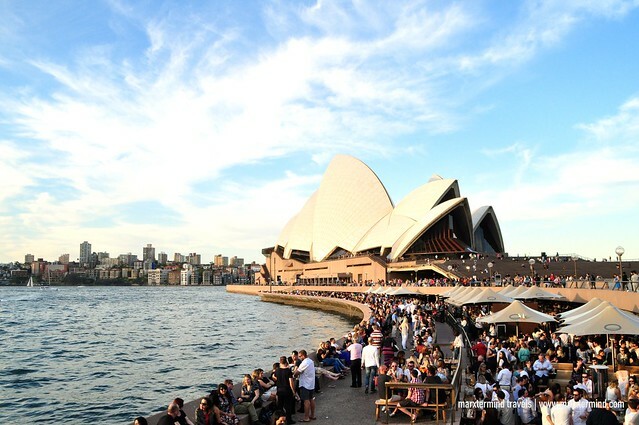 I spent 6 days in Sydney, 3 of which were spent by touring the city and nearby places while the rest was for Blue Mountains and Hunter Valley. Because I have friends who were willing to tour me around, I didn’t make a solid itinerary anymore. I noted some famous sites to go but that was it. I didn’t search for directions. I left everything to my companions – and let them take me anywhere. Touring around Sydney was actually easy. Getting around was very convenient because of the systematized transportation, walkable streets and easy directions. It had become a lot easier in my experience because I had instant tour guides who accompanied me to get to the famous sites. 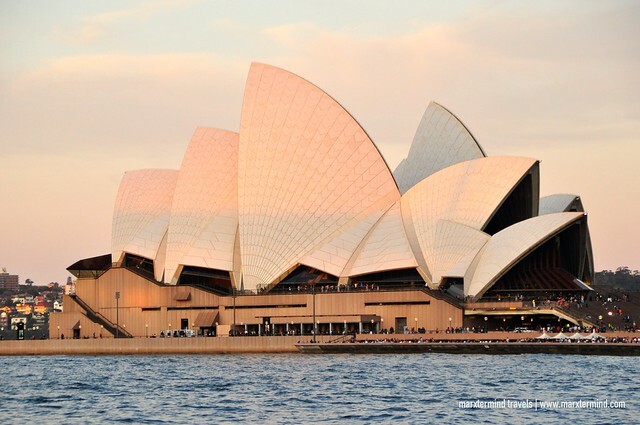 The most important part of touring the city is visiting its most iconic landmark, and for Sydney that is the Sydney Opera House. I had just checked in to my room at Park Regis Hotel past noontime when I had to get out already. I did not have the chance to linger because my friend, Gay, was already waiting for me at the lobby. We agreed to meet on the day of my arrival. 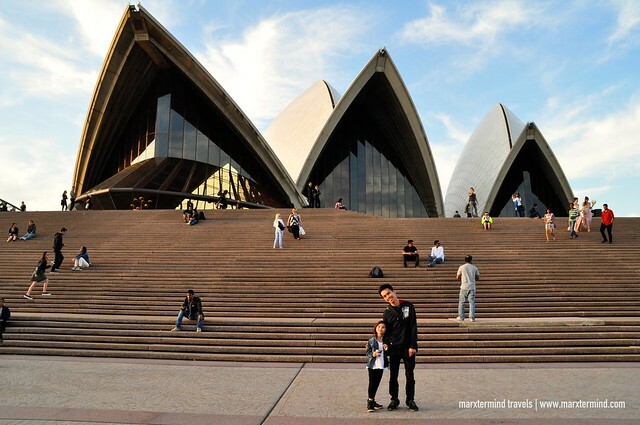 It was my first day in Sydney, so first things first; we had to visit Sydney Opera House. From my hotel in Park Street, we walked more than 2 kilometres going to Sydney Opera House. The walk took about 30 minutes. It was tiring but for a visitor like me who was getting amused with the city vibe and the sights around, I’ve found the long walk quite enjoyable. As expected, the harbour area was crowded. A Chocolate Festival was also happening at The Rocks making the place more packed with people. I was in awe when I finally saw the Sydney Opera House. It was one of the “wow” moments. There were no words to describe. I just couldn’t believe that I made it to Australia. 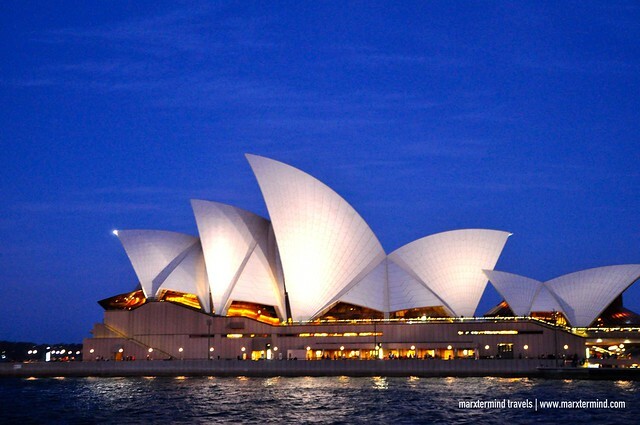 Sydney Opera House is the most celebrated landmark not only in Sydney but also for the entire country. 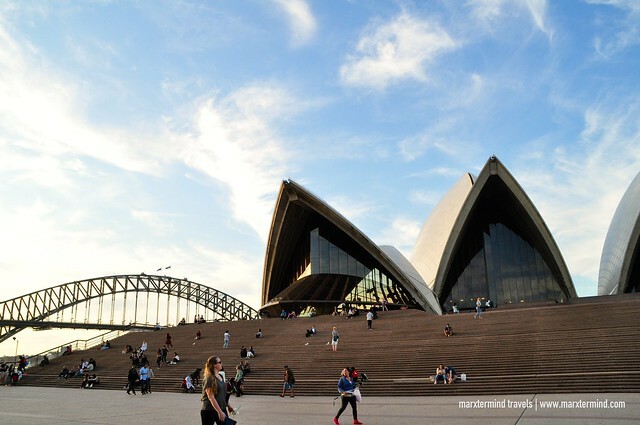 This famous structure is a multi-venue performing arts centre. 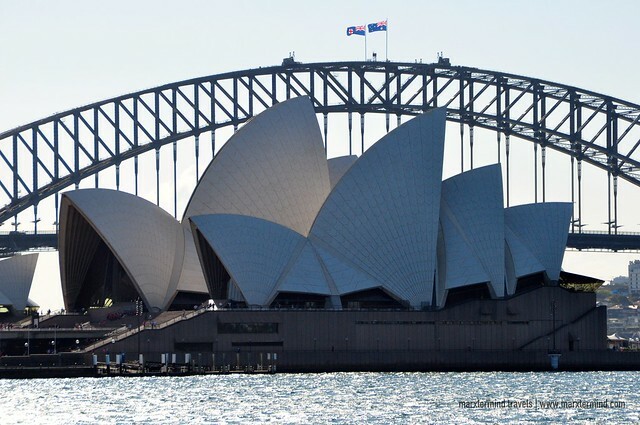 The opera house resembles the shape of the sails of a boat. Seeing it was dreamlike. I didn’t mind how crowded the place was when we arrived but it was truly fantastic seeing the iconic landmark. The feeling was more when I got closer to it. I just wished that I had able to get inside – or maybe had the chance to watch a play at the opera house. We spent some time taking pictures – and Luna, had a picnic. Just across the bay is where the Harbour Bridge is. It is another popular spot in the city. 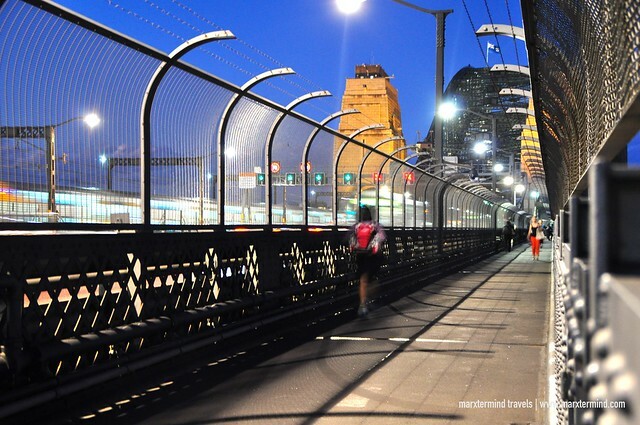 It is steel through arch bridge across Sydney Harbour that carries rail, vehicular, bicycle, and pedestrian traffic. The bridge connects the central business district of Sydney and the North Shore. 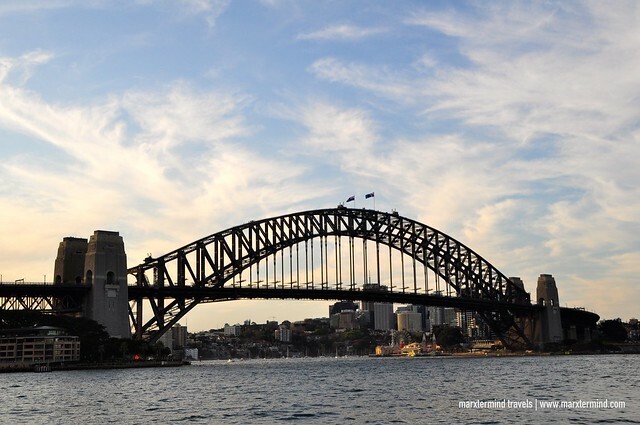 It is said to be the world’s largest steel arch bridge with the top of the bridge standing 134 meters above the harbour. From our vantage at the opera house, I can clearly see the magnificent form of the Harbour Bridge. 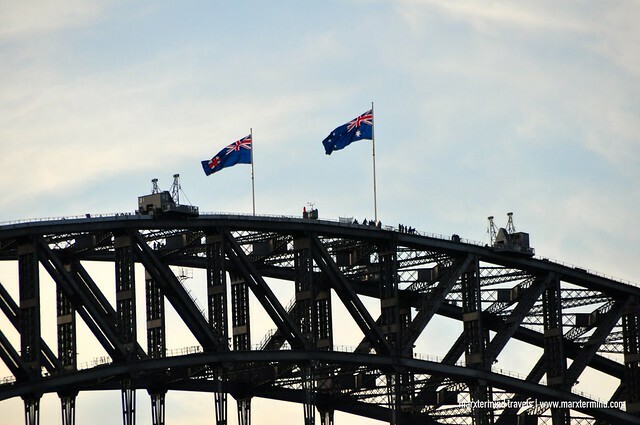 It was interesting that people can also get to the top of the bridge by joining BridgeClimb Sydney; a tour company that provides climb experiences to the top of the Sydney Harbour Bridge. Because it wasn’t part of my budget, I gave up the idea and crossed the bridge instead by going on a stroll through the pedestrian walkway. One of the interesting little hidden gems to see in the city is the Angel Place Birdcages. Gay brought me to this area, which is a secluded one because it wasn’t along the road. It was located in one of the alleyways in the city. 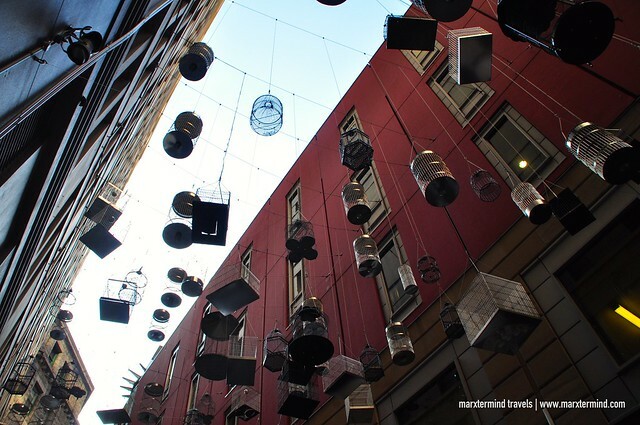 The small street has art exhibit of 110 empty birdcages suspended high in the air. Michael Thomas Hill created this whimsical installation, which is known as the Forgotten Songs. It said to commemorate the songs of fifty birds that once lived in central Sydney before the settlement and urbanisation of the area. Hyde Park is just a stone’s throw away from where I was staying in Park Street. The park is said to be the oldest park in Australia. 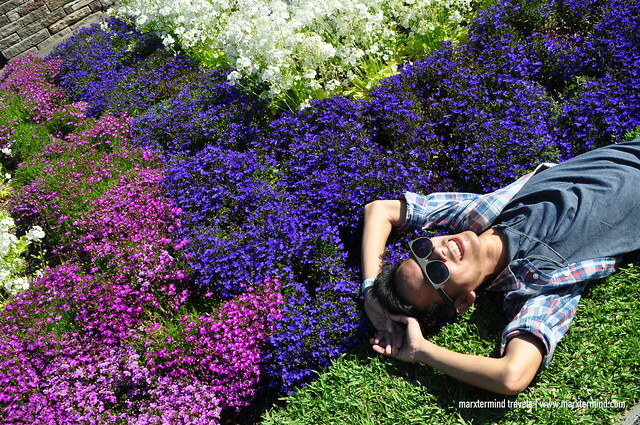 I visited the park one morning while waiting for another friend, Majoy. Since she won’t be able to make it on time to our meeting place, I’ve decided to get around a bit by myself and had a walk. The park is 16.2 hectares in size but I had only seen a small portion of the parkland. I guess it was because I was conscious of the time that my friend could be in our meeting place any minute. 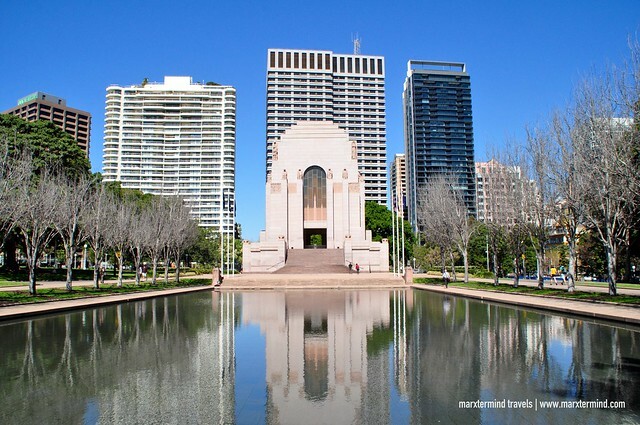 Located inside the park is where I’ve also seen the Anzac Memorial, the main commemorative military monument of Sydney. 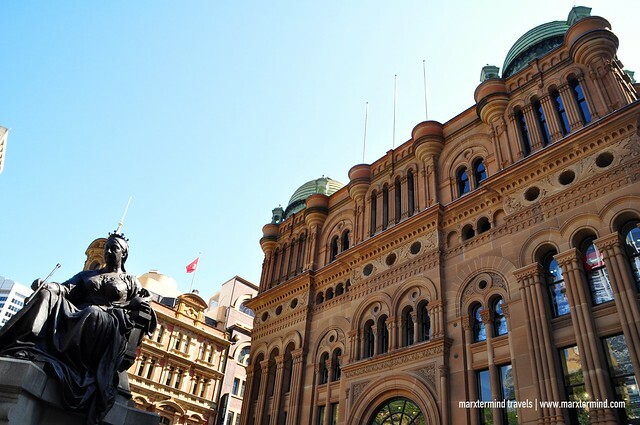 Another place close to where I was staying is the Queen Victoria Building, better known as QVB. It is a popular building along George Street because of its heritage and architecture. The building was constructed between 1893 and 1898. Architect George McRae designed the building. It was designed as a marketplace but later on used for a variety of other purposes. The building underwent remodelling and suffered decay until its restoration and return to its original use. The building now contains mostly upmarket boutiques and shops. It also houses high-end fashion stores, cafes, and restaurants. 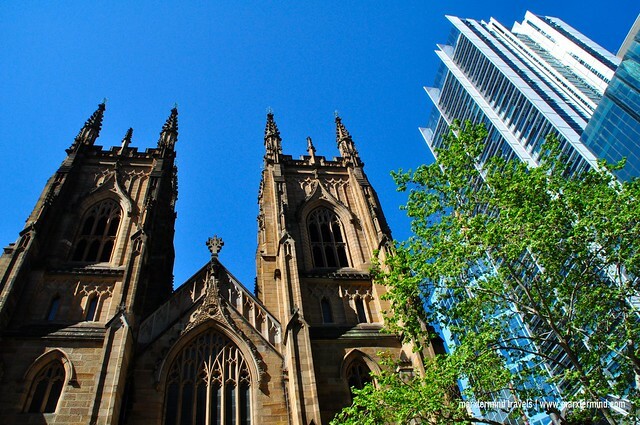 Located in central business district, the cathedral is one of Sydney’s finest examples of Gothic Revival architecture. 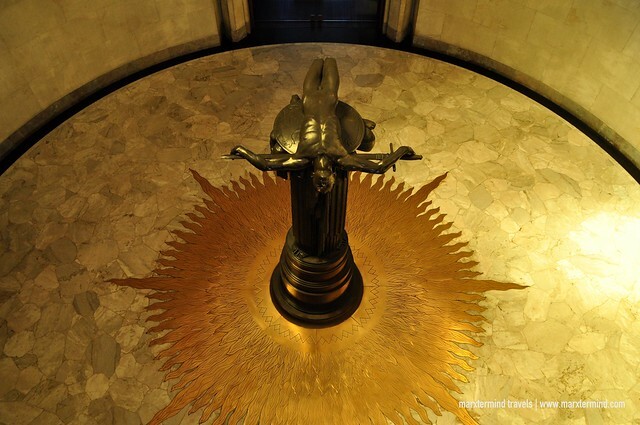 Edmund Blacket designed it. St. Andrew’s Cathedral is the cathedral church of the Anglican Diocese of Sydney in the Anglican Church of Australia. It was past lunchtime when my friend Majoy and I had able to meet. We met at the Town Hall Station (train station). From there, we rode a train and alighted at the Martin Place Station. Then, about 15 minutes walk from the train station, we were able to pass by the Public Library of New South Wales. The Public Library of New South Wales is a large reference and research library that is open to the public. 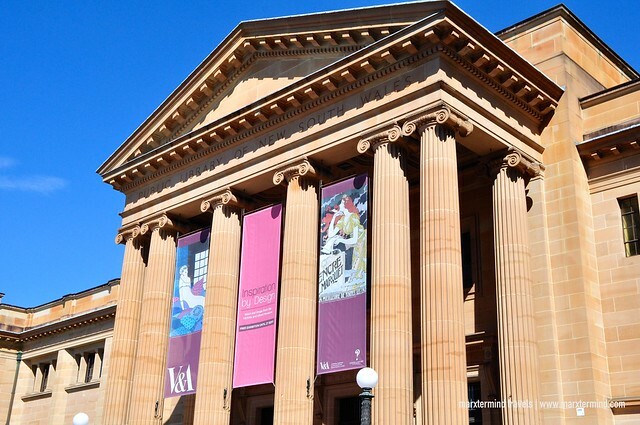 It is said to be the oldest library in the country, being the first one to be established in New South Wales. We didn’t go inside the library anymore as we have other tourist spots that we planned to visit that day. We just passed by the building and continued walking towards our intended destination, the Royal Botanic Gardens. I enjoy going to gardens more than zoos. 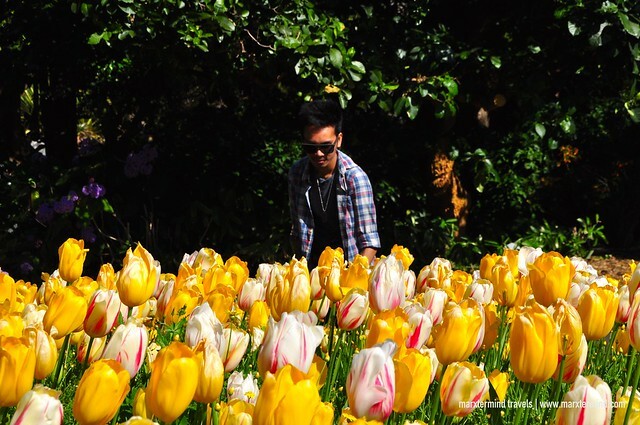 With that, you already have an idea how much I enjoyed exploring the Royal Botanic Gardens of Sydney when my friend and I visited it. 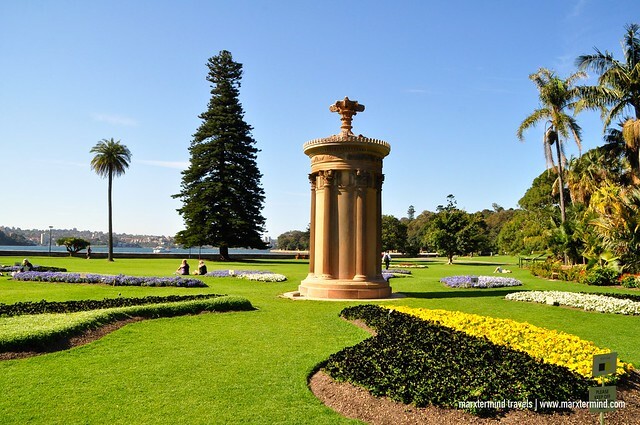 Royal Botanic Gardens is a major botanical garden in Sydney. It is open to all and can be accessed by anyone for free. 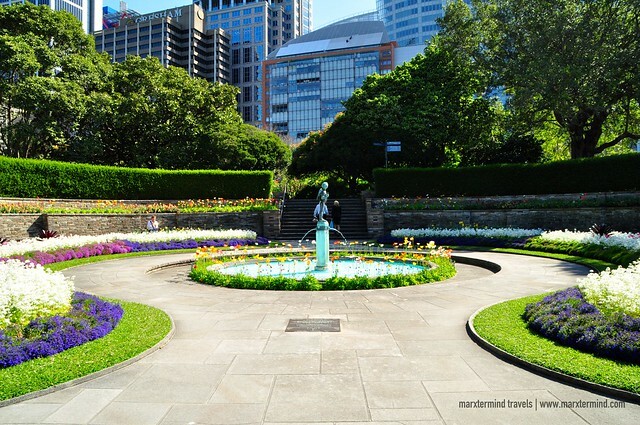 The garden covers a sizeable of 30 hectares, which is divided into four major precincts called the Lower Gardens, the Middle Gardens, the Palace Gardens and the Bennelong precinct. Majoy and I spent most of our time walking around, taking pictures and some selfie. It was springtime when I was in Sydney and vegetation was beginning to appear. I was fascinated of how beautiful the garden was, moreover when I saw plots of land where the floras are. They were in different kinds and colors. Just imagine how much time Majoy and I spent on those areas. The Mrs. Macquarie Chair can also be easily reached from the garden. 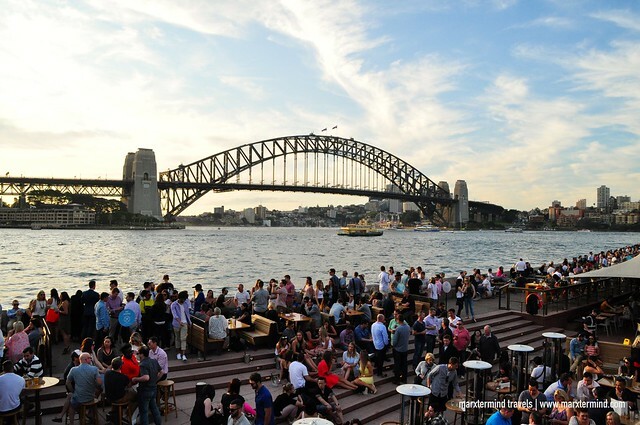 This spot provides one of the best vantage points in Sydney. This historic chair was shaped out of a rock ledge for Governor Lachlan Macquarie’s wife, Elizabeth. She was known to visit the area and sit adoring the panoramic views of the harbour. We went out of the garden after 3 hours of spending there. We walked through the path towards the Sydney Opera House. Then, from there, we went to Circular Quay and rode a ferry going to Manly Beach. 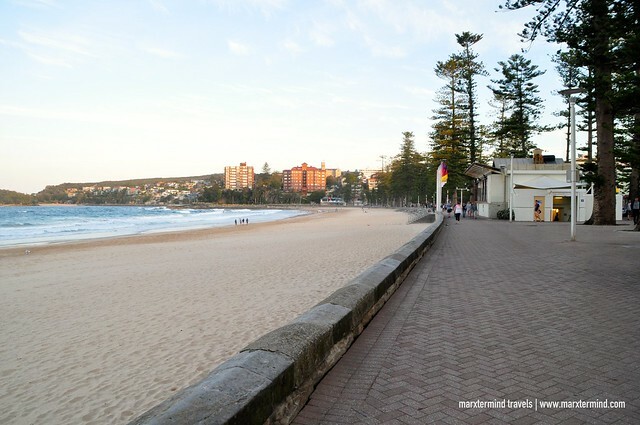 Manly Beach is a renowned beach destination situated among the Northern Beaches of Sydney. 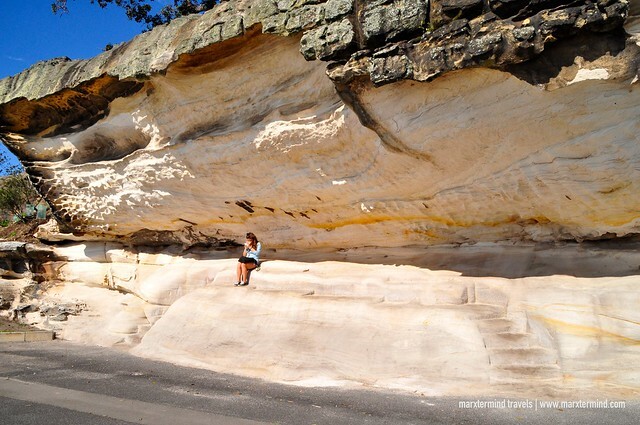 This beach is an easy ferry ride from Circular Quay across Sydney Harbour. Ferry ride takes about half an hour and costs from AU$5 to AU$6.80 per person. It was around 4:00 PM when my friend and I were able to arrive at Manly. We didn’t plan to spend so much time on this part of Sydney because we’re chasing a schedule for another activity that we were planning to do in the city. 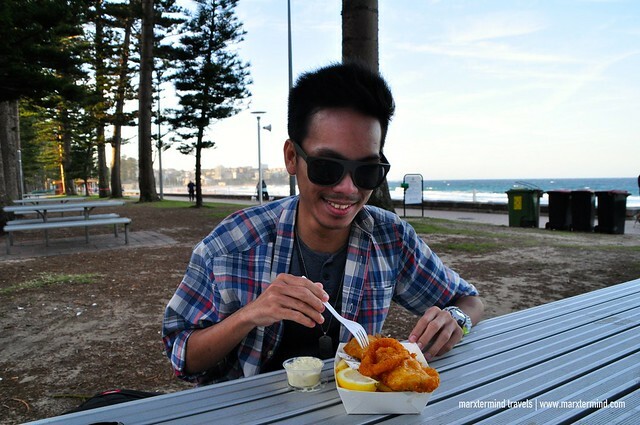 One of the few things that we were able to do at Manly was to eat fish and chips. Since I haven’t had one yet since I arrived in Australia, Majoy suggested that we could have it Manly since it was there where she was able to taste the best fish and chips in Australia. We had our Fish and Chips at Manly Ocean Foods. The meal was $14.50 – and the serving was big. Majoy and I should have just shared at one meal. The weather wasn’t that great when we visited Manly Beach. It was gusty – and I was chilling all the time. I was only a wearing polo and a shirt and I couldn’t bear the breeze. We went to the beach area and took some photos after finishing our food. The beach wasn’t that crowded compared to Bondi. The place was peaceful but the ocean was raging. 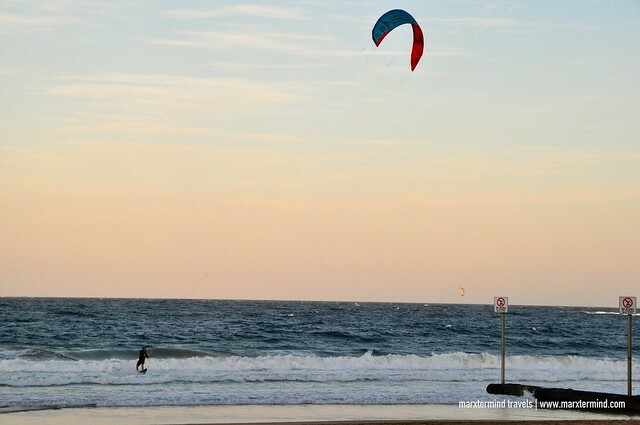 There was no doubt why Manly Beach is one of the country’s best surfing beaches. After a while, we’ve decided to get out of the beach. We walked back to the port area and rode the departing ferry bound to Sydney. It was a very quick visit to Manly. I hope when I return, I could spend a night or two in Manly and explore the nicest beaches and other tourist attractions that this place has. And perhaps do a coastal walk just like what we had when we visited Bondi the last time. 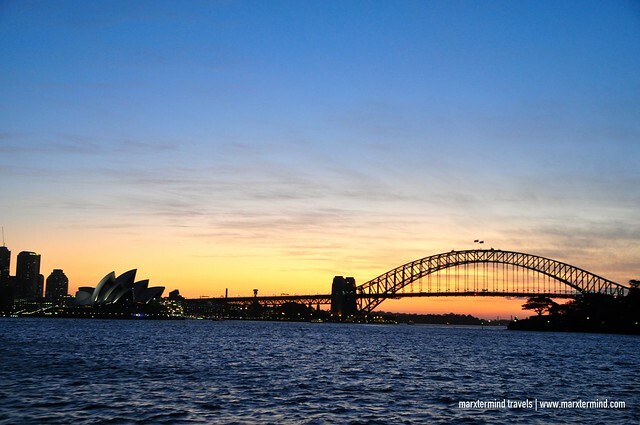 We boarded the perfect ferry back to Sydney because we were able to see the iconic landmarks and view the city while the sun set. Should I say more? It was sunset – and you know how romantic sunset cruise is. 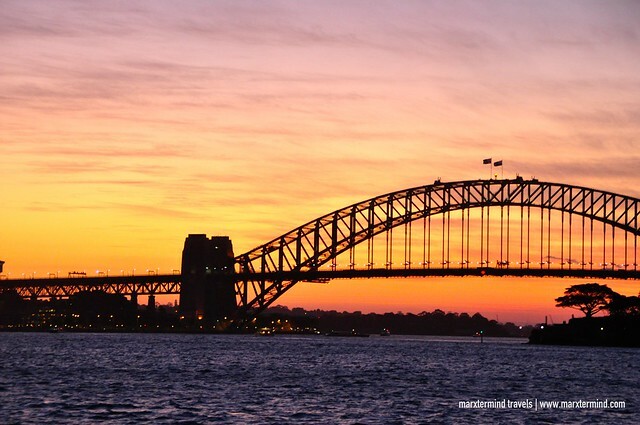 Well, I didn’t have a romantic partner with me that time but cruising at the Sydney Harbour during sunset was truly a remarkable experience to do while in the city. We were supposed to go to Wildlife and Sealife Sydney but it was too bad that we weren’t able to catch the cut off time for admission. 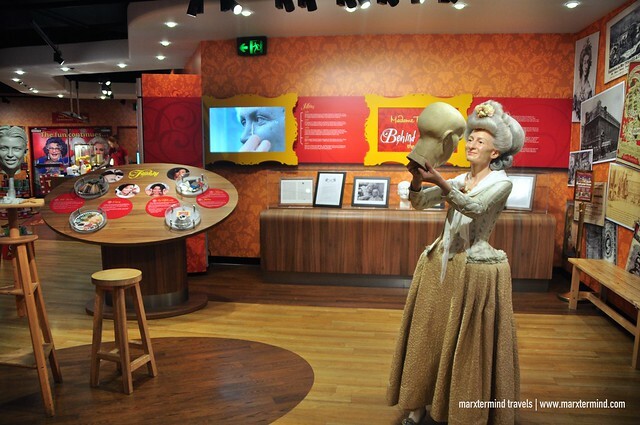 It was only 6:00 PM and the only tourist attraction left that we could visit at the Darling Harbour was the Madame Tussauds Sydney. My friend Majoy has free passes for us. Normally, ticket costs $40 per person. 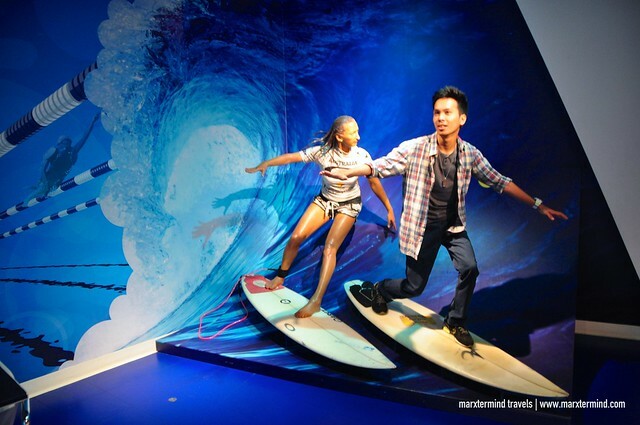 My first experience of Madame Tussauds was in Bangkok – and I had fun. 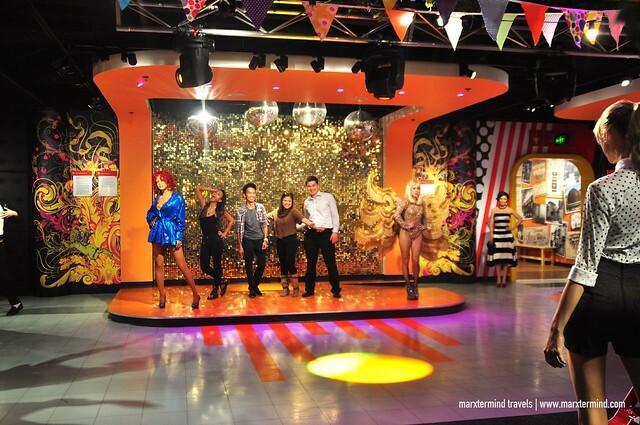 Madame Tussauds Sydney is home to more than 70 lifelike celebrities, sporting legends, rock stars and politicians. 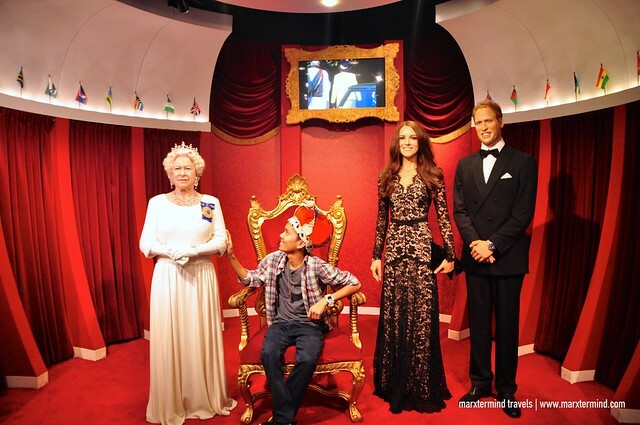 This time, my friend, Gay and Majoy’s boyfriend, Rhys joined us in our visit to Madame Tussauds Sydney. Inside, we were able to meet the lifelike of some historical greats, leaders, famous sporting heroes and our favorite stars and personalities. Our visit was filled with fun interactive experiences with the lifelike personas. It was an enjoyable night bonding with my friends in Sydney. 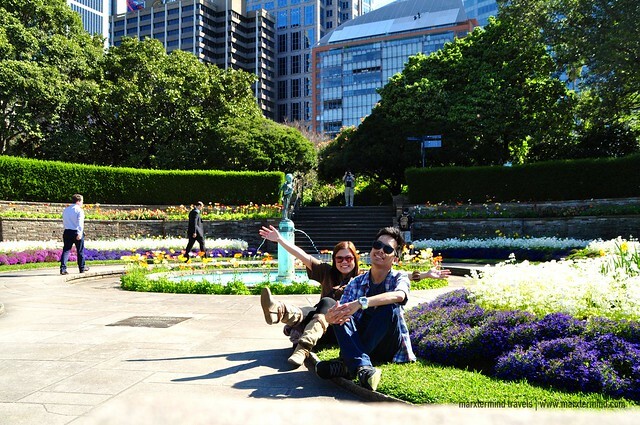 To maximise the use of free passes that my friend Majoy has, we also went to Sydney Tower Eye. From Darling Harbour, we walked about one kilometre to reach the famous observation tower. 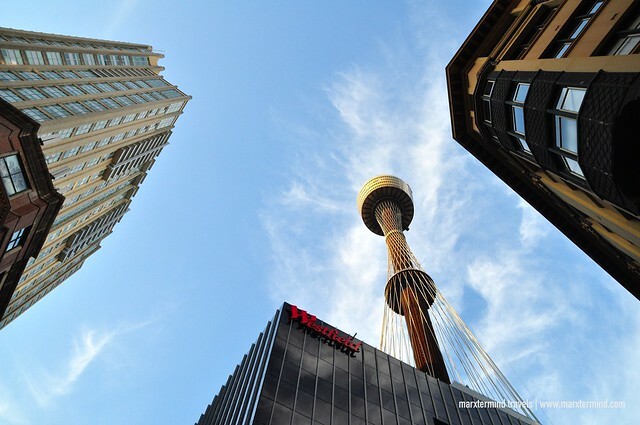 The Sydney Tower Eye is an important part of the skyline of the city for the past 30 years. It is Sydney’s tallest structure and the second tallest observation tower in the Southern Hemisphere. 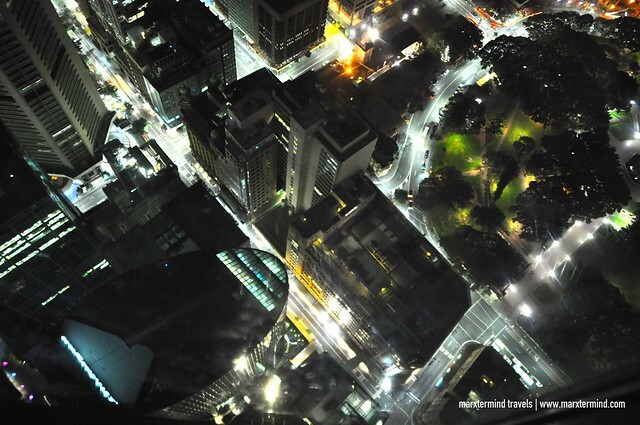 The observation deck offers an ultimate view of Sydney. 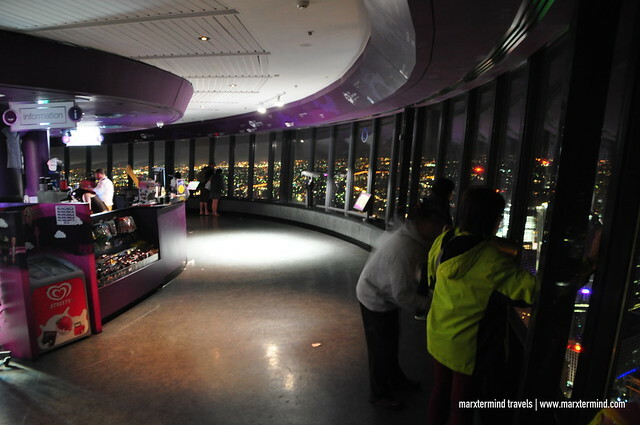 The rate to get entry to the observation deck starts from $18.55 per person. It is open everyday from 9:00 AM to 10:00 PM, with last guest entry at 9:00 PM. It was past 8:00 PM when we finished all our activities that day. It was fun getting around Sydney and exploring the famous tourist attractions with my dear friends. I was glad that they accompanied me while I was in the city because it had detached me from the thought that this trip was actually a solo travel. 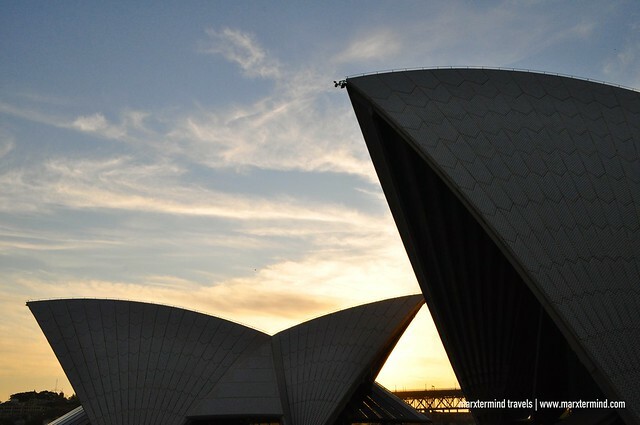 My visit to Sydney is one of my best travel memories not only because of the several admirable places that I’ve visited but also because I had my friends who gladly went with me to explore the great places that Sydney has. 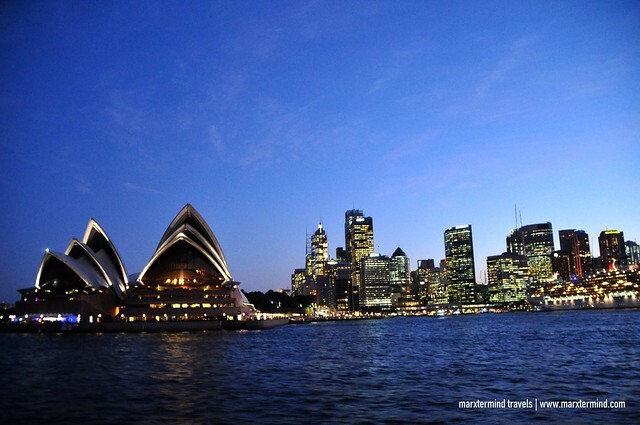 It was such a short time actually that I only spent 6 days in Sydney. The places that I’ve visited to say that I’ve perfectly explored Sydney are actually not complete yet. There are still a lot of places that could be visited in Sydney that definitely I’ll make time when I return to the city.